Our soap is made with no sodium lauryl sulphates , parabens or chemicals. Our soap is made by hand using the “cold process” of soap making. All our handmade soaps are made with the best quality ingredients, including essential oils. Our natural handmade soaps contain luxurious ingredients that moisturize the skin and delight the senses. 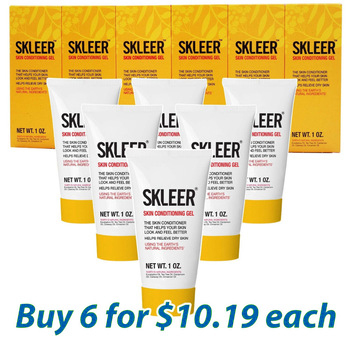 SKLEER products are of the highest quality possible. They contain 99% natural, ingredients that have been specially selected because they can relieve your skin and scalp problems in the gentlest, most effective way. Wonderful natural ingredients such as Essential Oils, Aloe Vera and Coconut Oil are used in our products. These ingredients are known for their extraordinary healing qualities and can help maintain healthy, vibrant skin and hair. A 24hr patch test is advised before using any product that is new to your skin care regime. For extremely sensitive skin, a sample size (25g) can be ordered for testing. 1: Gently rub bar directly on to warm wet skin and leave on for a minimum of 2 minutes before rinsing with plenty of clean warm (not hot) running water. A few splashes of cool water will help to close pores before gently patting dry with a clean towel. Rinse your bar and leave it to drain so that it lasts longer. QUICK-ABSORBING SOAP THAT ACTS LIKE A SERUM! Draws herbal actives into the lower layers of the skin for maximum penetration, with no drying, no greasy or sticky residue. The antioxidant and anti-inflammatory effects of essential oils create an incredible environment for the skin to regain its natural brilliance! HELPS RESTORE YOUR SKIN to health, lightening dark spots, calming irritated and red skin, even reducing lines and wrinkles. Brings vitality back to dull skin, toning, firming, and brightening it. 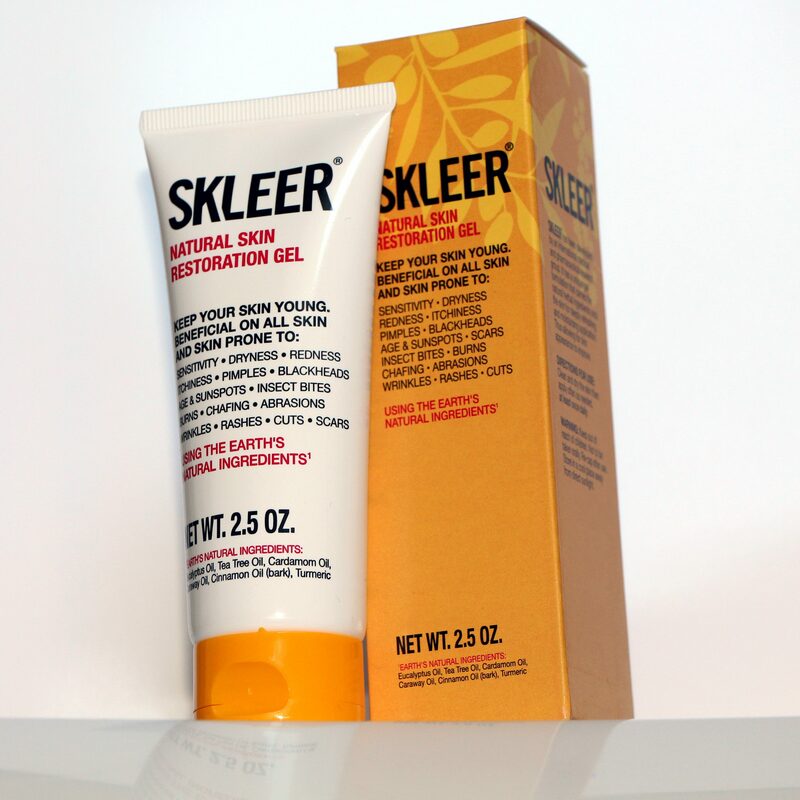 Along with sunscreen, helps combat the negative effects of sun’s UV rays. Perfect choice for dry, normal, oily, sensitive, or acne-prone skin. APPLY IT TO ANY INJURY to prevent scars from developing. Apply to it an existing scar to reduce or eliminate it. How long does Skleer take to work? It depends on the condition. It can take as long as it originally took for the condition to develop, but most users begin to get results much sooner. E.g., insect bites can stop itching within minutes, but old scars may take months. NO ANIMAL TESTING OR ANIMAL PRODUCTS. No acids, alkalis or harmful preservatives that damage that the skin’s natural protective integrity and interfere with the skin’s amazing natural healing ability. 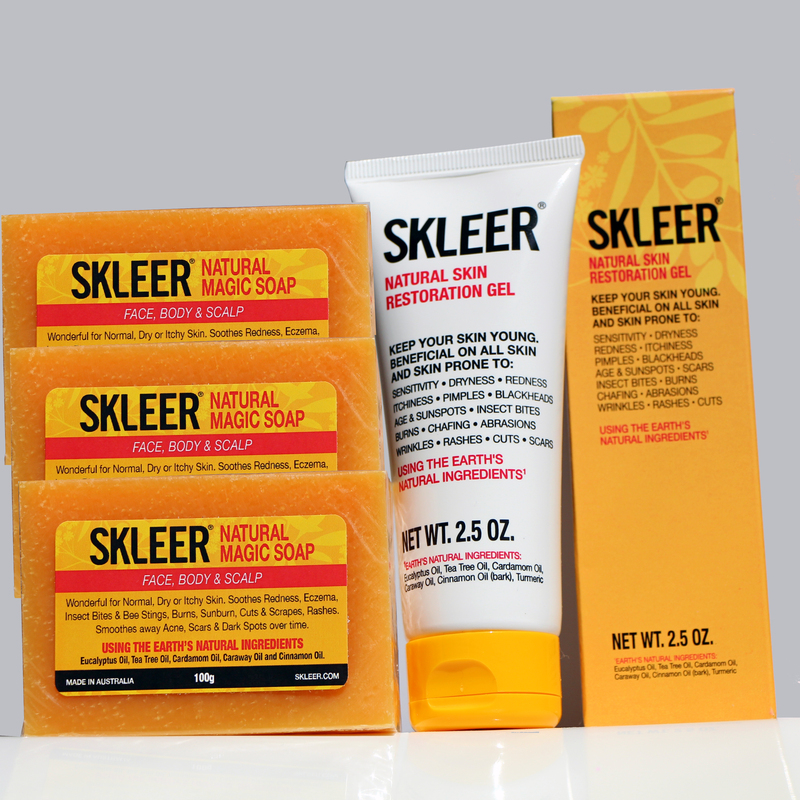 SKLEER’S NATURAL ESSENTIAL OILS have been used for healing throughout history.The ancient Romans, Egyptians, and Greeks, early Ayurvedic practitioners in India, Europeans of the Middle Ages, and many native peoples in Africa, Asia, and Oceania valued these oils for their healing properties. These oils contain ANTIOXIDANTS, which boost immune function and combat free radicals, have an ANTI-INFLAMMATORY effect, tone & intensely hydrate the skin, and support the skin’s natural ability to heal. EUCALYPTUS OIL: Antibacterial, anti-fungal and stimulating qualities. Soothing to skin injuries, including burns. TEA TREE OIL: Antibacterial, antiviral, antifungal. Strong antiseptic. CARDAMOM OIL: Rich in vitamins A, C, niacin, pyrimidine, riboflavin, thiamine, and minerals. Has been shown in scientific studies to inhibit the growth & spread of many microorganisms. CARAWAY OIL: Antihistaminic and tonic. Very effective as an anti-inflammatory by neutralizing the effects of histamine. Its tonic effect helps brighten the skin. CINNAMON OIL: Antifungal, antibacterial, antiviral effects. Active in treating topical infections. 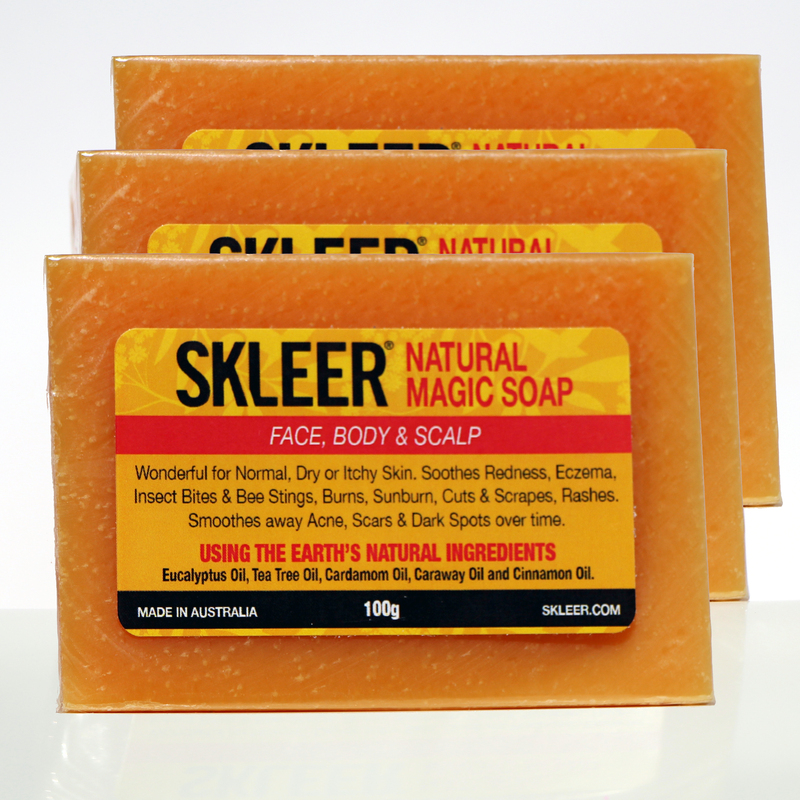 SKLEER’S PROPRIETARY SOAP FORMULA plus ESSENTIAL OILS-equals an innovative blend of scientific knowledge and the earth’s ancient, plant-derived, naturally healing ingredients. Formulated to penetrate and deeply moisturize while supporting your skin’s inner ability to heal. Short term conditions – Use twice daily, up to hourly: dull, red, or dry skin, eczema, spot pimples, tattoos, waxing, insect bites. Amazing, clean, refreshing, and it’s good for your skin!